There has been an evacuation of the site. File photo of Dublin Fire Brigade training exercise. DUBLIN FIRE BRIGADE is attending the scene of a suspected chemical leak at the SK Biotek manufacturing plant in Swords. The fire service, which deals with incidents involving hazardous materials, was called to the scene earlier this morning. It is understood there has been an evacuation of the site. A spokesperson for Dublin Fire Brigade confirmed they are attending this incident. Six units and two senior officers responded to the incident, they said. Staff at the manufacturing plant are working in conjunction with on-site professionals. It is in anticipated that the fire brigade will be onsite until around 2pm. In a statement, a spokesperson for SK Biotek said: “In accordance with standard company health and safety protocol SK Biotek alerted the emergency services when a chemical leak occurred within an enclosed unit in a pre-production preparation area this morning. No members of staff were injured and there have been no releases to the environment. The company has procedures in place for any such event and all appropriate measures have been taken to mitigate the impact of the incident. This always includes, as a matter of health and safety precaution and best practice, the evacuation of site personnel in the immediate area. 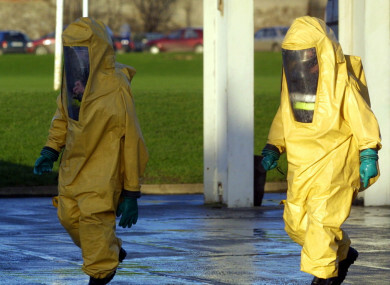 Email “Dublin Fire Brigade called to chemical leak at SK Biotek manufacturing plant ”. Feedback on “Dublin Fire Brigade called to chemical leak at SK Biotek manufacturing plant ”.